One of my favourite fall dishes. It was created because these are simply all my favourite foods in one salad. 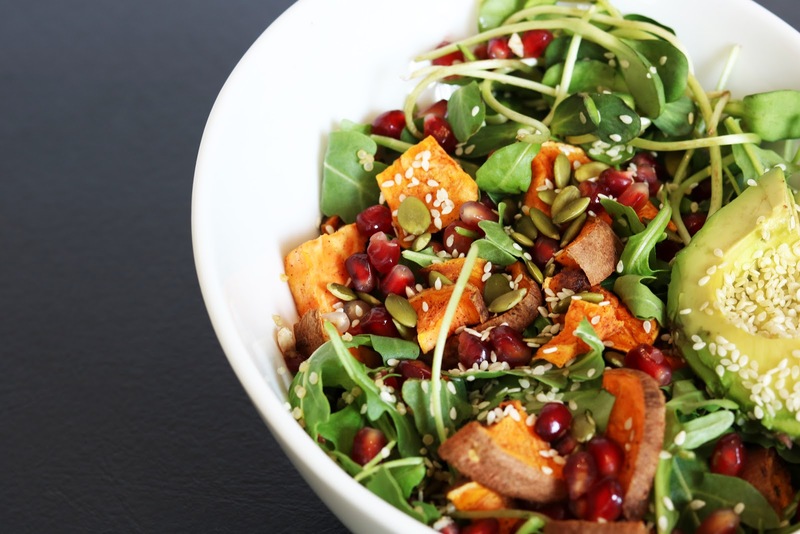 This sweet potato pomegranate is a great crowd pleasing side dish to bring to a party, loved by all vegans and non-vegans. Further, it makes a great left over lunch. 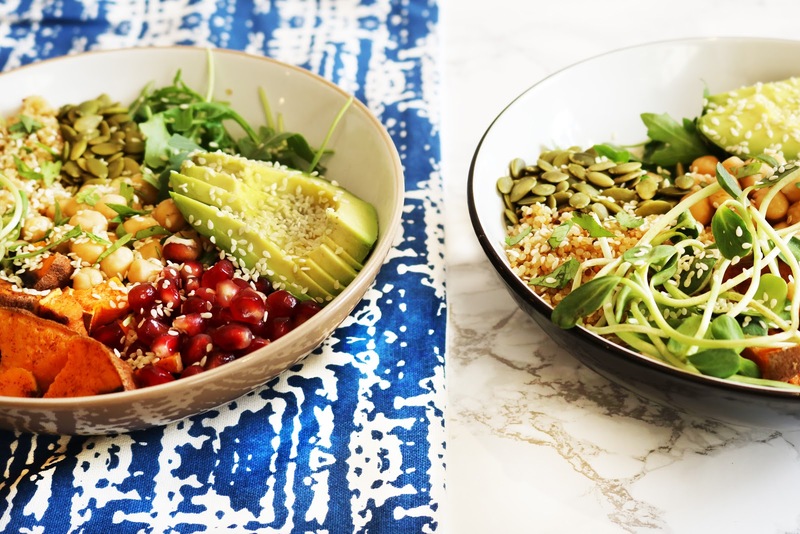 Add protein such as chickpeas, lentils or frozen edamame to make this a colourful and nourish power bowl. I also have added sprouts and additional veggies such as cucumber and sweet pepper. If you try this recipe, I’d love to see it! Comment your thoughts, or tag @Plentyfullvegan and #Plentyfullvegan on Instagram. A perfect blend of sweet and savoury, a filing meal or great side dish. Chop sweet potato into cubes, mix with cinnamon. Bake on a pan lined with parchment paper for 40-45 minutes. While the sweet potato bakes, boil water for the quinoa. Add the quinoa and reduce to a simmer for 15 minutes. To peel pomegranate cut into quarters. Fill a bowl with water and take out the seeds while the fruit is immersed. Then strain out the water with a mesh strainer. This makes it a lot easier with less mess! Once every thing is cooked mix the arugula and quinoa with lemon and olive oil. 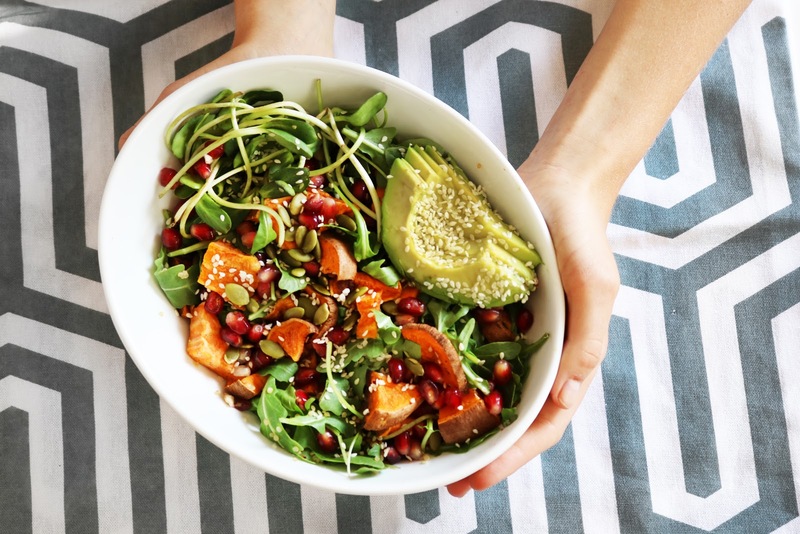 Add the sweet potato, pomegranate, sliced avocado. Garnish with seeds, cilantro and black pepper! This makes a great side salad or lunch! 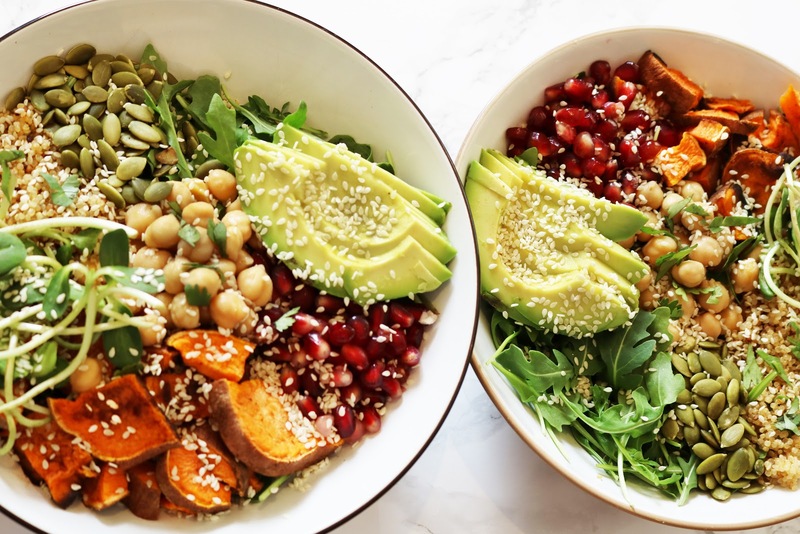 To make this into a Buddha bowl, add a protein such as chickpeas or lentils!